The north eastern part of the United States was hit by a winter snow storm just after Christmas with at least 16 people reported dead and thousands of passengers stranded due to the cancellation of more than 1000 flights since Wednesday. The affected areas were Massachusetts, Maine, Vermont, New Hampshire, Pennsylvania, Arkansas, Alabama, Texas, Virginia, Ohio, Louisiana, Kentucky and New York. The severe storm has dumped a “record breaking snow” to the states of New England. 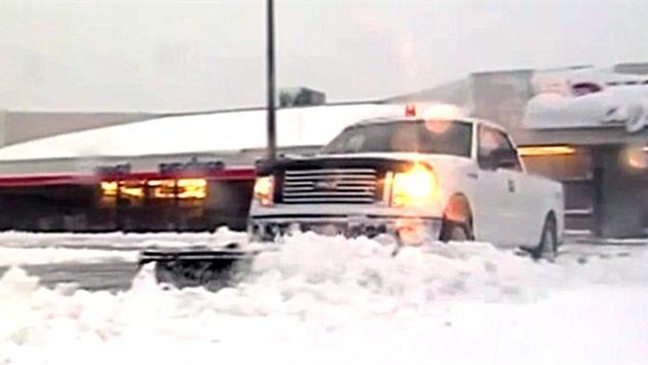 Some areas were reported to be covered with 12 inches to over a foot of snow. The traffic has been in chaos due to the severe snowstorm. The roads have become too dangerous for motorists. Some of the deaths were caused by car collisions and crashes. Houses, vehicles, electric posts and roads were covered with thick snow. Some trees were uprooted due to the strong winds. While the heavy snow was falling in Midwest and Northeast, more than 30 tornadoes were reported in Alabama and Mississippi. These two places have been declared to be in the state of emergency. The tornadoes crossed the states with a speed of more than 100 mph. There is no electricity in the affected areas and authorities advised that it could take a week for the power to be restored. Last week, Ukraine had its cold spell with around 83 people reported dead and more than 500 being treated in hospitals for hypothermia and frostbite. Most of those who died were the homeless people. The very low temperature of -17 degrees Celcius was caused by the cold arctic air. More people died last year because of this kind of weather condition in this part of Eastern Europe.